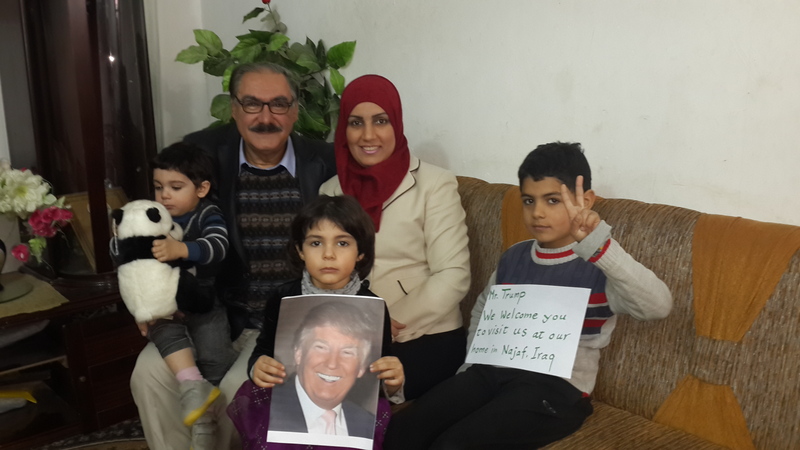 Sami Rasouli and family in Najaf, Iraq. Photo by Sami Rasouli. These guest visits are part of the cultural exchange program for Muslim Peacemaker Teams. They have been ongoing between citizens of Najaf, Iraq, and of Minneapolis since the two officially became "sister cities" in July 2009. The purpose of your visit would be educational in nature- focused on learning about Arab-Islamic culture, including opportunities to visit Iraq's major historical cities, such as Babylon, and its holy cities, such as Najaf, Karbala and Baghdad. You would learn about Hammurabi, who wrote the first code of law, and you would visit the countryside in the South, where an Iraqi woman invented the wheel 3,000 years ago. I'm not rich, Mr. Trump, but my family and I are renting a house in Najaf, the holy Shia city where I was born. Our home is small, cozy and full of love. You would stay with us and share what we have. In addition, there are other Iraqi families who would love the opportunity to host you and treat you as family. In Najaf I assure you that you would find that we (a so-called infidel visiting terrorists) are all brothers and sisters sharing the same bread and the same universe. You would learn how our peoples, including the Jewish, share the Old Testament as the foundation of our respective religions. We have far more values in common than we have differences. We are all "people of the Book." We could even take you to Ur, where Abraham was born, to Jonas' tomb near Mosul, to Daniel's tomb near Babylon, and to the monastery founded by Saint Matthew. In return, should you accept our offer to visit Najaf, my family and I would gladly visit you in New York or Vegas. We would even spend money and have fun - despite the fact that our faith as Muslims bans us from entering the "Sin City." But, for you, we would break the rules. All you need is to purchase your plane ticket, and we will gladly cover the cost of everything else. I know you're busy with the presidential campaign, so, if you understandably can't make it at the present time, our offer remains open for you to visit us at any time you choose. As a politician and businessman, you know that the resolution of conflict begins and ends with educated and open minds sharing meaningful, productive discussion. Our offer to you is an opportunity to resolve global conflict. Please give it thoughtful consideration.